Preface: These statements were reproduced from the Tiger E-mail list to provide an easily reached collection of this important discussion, as well as preserve it's content and organiaztion for later needs. Anybody out there who has done Dale Akuszewski's Ackerman fix with the MGB steering arms and STOCK 13" diameter rims? If so, I'd appreciate it if you'd contact me off list--I could use some input. Actually, I'd also really like to hear about this from someone who has done it. What is the end result? Dale has kindly given me some information about the mod and has said that Ackerman is largely addressed by the change. He has also said that the resulting steering ratio is much quicker. I'm just wondering if someone can give some post-project driving impressions regarding improvements in handling and impact on steering effort. Dave and Shaun. I did the conversion, and here are the results. First, I have 15" Panasports, with 195-50 tires, and am using a 14" steering wheel. The front end has been completely rebuilt, and the car have been aligned. See my article in the Tiger United site. I measured the Ackerman angle after I did the conversion on turntables, and it brings the Ackerman angle back to about zero. I don't have my shop manual handy, but the Ackerman angle was in the wrong direction, by about 3 degrees, resulting in problems discussed many times before. Any way, this is a vast improvement, but will not make up for a suspension system that is not in good condition. Just rebuild it, so that you know what you are dealing with as a base line. After all the car is over 35 years old. As far as steering, at rest, the steering wheel is hard to turn. Once moving, there is no problem at all. Sort of like a pickup, before power steering. The MG Midget R&P is a much quicker ratio. My memory is that the Tiger is a 3.7:1 lock to lock, and the Midget is 2.7:1. I fitted my R&P with a grease fitting, and of course new boots. I use Mobil 1 in the R&P for a lubricant, and can add to it at any time. On the road, the car and the steering is not twitchy, tracks well, and at 80 mph, you could take your hands off the wheel and it will not move on you. This is first really due to a good alignment, and a suspension that is good, and then no inherent problems with the kit and set up. Bottom line, I would do it again. But first, get your stock suspension in good shape. Rebuild everything, install the kit, and get it aligned properly, and that is with you, the driver sitting in the car, as the caster and camber will change. The Ackerman kit significantly corrects an inherent design problem, but it will not solve a bad suspension. > discouraging as far as any improvement with using the MGB steering arms. I did not move the ack back in the analysis since most of the Tigers have the crank pulley very close to it. Makes for a difficulty belt change if needed? > doubt that many passenger autos come with perfect Ackerman either. Steering analysis is at best difficult, for sure. Since there are a billion tires out there who can include them all in an analysis? The race guys generally have only one tire to fiddle with and the manufacturer supports them. We are not so lucky. I do know that toe out in front is a very large no-no in straight line activities because our the wild steering conditions that happen. If the car lifts and takes some of the weight off of the front end, when it comes down it will dart like a son of a gun to one side or the other. So me, I'd rather have just about zero toe. Toe on the back generally relates to helping to drive the car around the circle track because of the forces being put on the outside tires. NASCAR does this. They also put in a lot of wedge to help with the steering and have lots of stagger in their tires. As to perfect Ackerman on production cars...nah. They try to get the vehicle to steer straight and safely. Power steering helps a lot in this respect. Whoa! Cannot compare apples to oranges. Doe the circle tract car have the same rack location? Does it have the same wheelbase? Doest it have the same front ball joint locations? Does it have the same location for the tie rod ends? Actually seems like nothing is the same. How many of you run your cars on the dirt track circuit or the NASCAR tracks? Not me, I barely drive mine anyhow. > pants approach to getting it right. >this time about the same as Mayf. says. > the wheel and the center of the rear axle as shown in the following link. > to give good results. Actually, according to my sources, this is the definition of Ackerman. If a line is drawn through the centerline of the rear axle housing and extended out a ways and lines drawn perpendicular to the front wheels and moved to a common intersect point then you have the correct Ackerman angle. Also you can put the wheels straight ahead and locate a point at the centerline of the rear axle housing. Then draw two lines one that intersects the line of the ball joints on either side of the car. 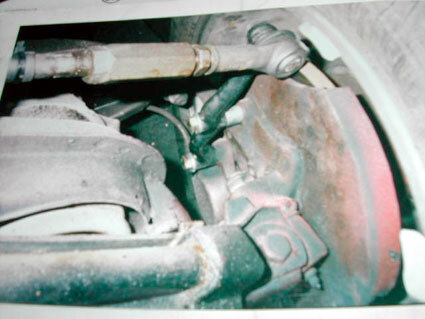 The correct steering arm tie rod location lies along this line. This works within reasonable measurement. As you can see, the front arms need to be outside of the ball joints, not inside like they are. If the steering was put in the rear then things would be vastly improved. I think this can be done with a double or rear sump oil pan and the rack and pinion going under the pan. > want to pursue it further. I have taken a quick look at Dr. Mayf's analysis and it appears correct and discouraging as far as any improvement with using the MGB steering arms. The only thing I would dispute is that the Tiger's geometry, with toe-in instead of toe-out in the turn causes "classic oversteer". Instead, this situation leads generally to understeer or "plowing" in hard cornering. Mayf's analysis notwithstanding, my own experience says adding the MGB arms is still worthwhile. The most direct evidence I have of an improvement is in backing up with the wheels turned to full lock; there is no noticeable scrubbing of the tires as there was before the change. The only changes I made to the steering geometry were the MGB arms and moving the rack back 1/2". The 1/2" longer MGB arms mean that the already large turn radius of the Tiger becomes even greater, although by how much I'm not sure. The improvement in Ackerman negates some of the effect of the longer arms. To add some background to this question, I will repeat what I have said previously that you don't really want accurate Ackerman, especially in a performance vehicle. What is left out of consideration are the slip angles of the tires in cornering and the dynamics of how those angles transition as you input steering changes. When these factors are considered, the situation becomes very difficult to analyze. Race teams spend lots of effort getting the steering adjustments right and wind up with settings that might seem strange, like running with toe-out in front, and toe-in in back, etc. I doubt that many passenger autos come with perfect Ackerman either. Here is a link to one discussion of Ackerman for circle track racing. Notice that they say a "typical" setting is 13 degrees for the inside wheel versus 10 degrees for the outside. This is two degrees more than perfect Ackerman according to Mayf. The main thing to note is the cut-and-try, seat of the pants approach to getting it right. Here's another link to this subject. Note the numbers for ideal Ackerman, this time about the same as Mayf. says. One method used to figure out the correct angle of the steering arm for, I presume, accurate Ackerman, is by drawing a line between the pivot point of the wheel and the center of the rear axle as shown in the following link. This is a rule-of-thumb long used for setting up steering geometry, but doesn't correspond to accurate Ackerman, but something that has been found to give good results. You can find numerous other Sites with information on this subject if you want to pursue it further. If you choose to run 13" wheels, then the performance limitations will probably exceed anything that you might hope to gain with the MGB steering arm modification. As background to my original posting: I wish I had known that there were interference problems before starting with this project, but I don't recall having seen any mention of it on any of the previous posts that discussed the MGB arms. Or perhaps someone had said "don't try this with 13" steel rims" and I chose to ignore it--always possible. It wasn't till I discovered the problem yesterday and spent some time working to resolve it that I realized that the guys on the Tiger list who've talked about successfully using the fix list were all running larger wheels. Aha! That's when I figured I'd better see if somebody out there has been down my particular road already and could save me some time and skull sweat. And I thought it might be best to ask for replies off-list since my focus was on the guys who had 13" rims and interference problems, and I didn't want to raise a stink. Unfortunately, so far I haven't found someone to share with me their resolution of this particular problem. However, it turns out that there are a couple of other guys who are in the same boat as I am--they've bought the MGB arms and "hit a wall" when there wasn't enough clearance for their stock steel rims. I think there has been discussion of Ackerman on the list before, but, as I mentioned to a couple of you already, I try to avoid the math and focus on the "put tab A into slot B". It was a little disconcerting to hear that even if I do get the darned things to work, the 13" rims might negate any benefits of the "fix". I'm trying to track down a bit of clarification on that at the moment. What I'm trying to do at this point is figure out what it takes--heating and rotating the end of the steering arm, downsizing the ball joints at the end of the arm, whatever--and then putting it out there for those who, like me, weren't clear that 13" rims are a problem. I thought that stating an observed problem along with its solution would be the most constructive way to handle it. If any of you think this is not a good plan, I'd like to know. If I come to a successful resolution of this problem and you want to add it to what you're setting up, I'll try to put something coherent together. By the way, Steve: This morning I checked the Midget steering rack I purchased and lo and behold! The ball joints seem to be identical to the SMALLER ones I found at Smitty's yesterday. They're not in good shape, but (if you'll allow me the pun) their shape is good! Or at least their size is good. Thanks for the suggestion! It provides a starting point. This is a email to Dave, which I pass on to other on this list. I chose 15 wheels, because of bigger rotors, 11", and not the kit. Again, I just looked at the pictures of Dr. Bob Jaffee's car, with his LAT-70 wheels, and they fit. Email: Dave, see post to Witt. I looked at a friends Tiger before I did this. He has LAT-70, 13" wheels, and I just looked at the pictures of his car. It is tight but does not hit even the dust boot. You must use a 1/2" spacer on the front bolt, and the rear bolt hole of the steering arm, must be elongated slightly for the 2 bolts to fit properly. If this is not done, it will not fit. Let me clarify a couple of points. First, as Mayf and all the other articles on Ackerman show, however you accomplish it, you want to move the tie rod ends outboard, in fact as far as you can for a Tiger with the rack so far forward. Moving the MGB arms inboard to get clearance for 13" rims would completely negate the advantage of using these arms. BTW, I assume you know that you have to swap sides, left/right, with the MGB arms to put the tie rod ends below the end of the arm as with the Tiger arms. On the MGB, the tie rod ends are on top. This is very important for bump steer, a factor which is at least as important as Ackerman angle. On an historical note, Doane Spencer moved the tie rod ends outboard by flipping the rotors and moving the whole caliper assembly outboard. I'm not sure about the wheel clearance problem. He was probably using 14" wheels; either that and/or shorter steering arms. I think I have some pictures somewhere. If I find them I will forward them to Steve to post along with this topic. As for the limitations of 13" wheels, there are several. The main one in terms of geometry is they limit how much rear clearance the wheels can have and, thus, how far inboard you can position the wheels. This limits wheel/tire width and also compromises the front suspension geometry. Factors like "scrub radius" and others I have since forgotten argue in favor of placing the front wheels as far inboard as possible. Just the practical aspect of getting 7" wide rims and fat tires inside the stock front wheel wells means you need at least 14" and better 15" diameter rims. Then, of course, there's the problem of getting performance tires for 13" wheels. There is a small advantage in terms of contact patch with larger diameter rims, but I think the main reason is to give clearance for larger brakes. Still, bigger is better, and all the really top performance tires only come in 16"-18" sizes, with only one or two choices for 15" rims. Finally, just a question for Mayf: How could it be that the position of the tie rod ends relative to the center of the rear axle is all that matters? That would mean that it doesn't matter where the rack is placed, which on the face of it seems incorrect. Bob, you misread or I misspoke. 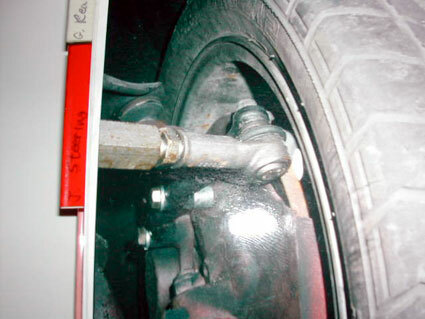 The tie rod end or the steering rod ends need to lie on the line drawn from the center of the rear end through theball joint line, either ahead of the ball joints or behind. The rack need to lie on the line between the steering rod tie rod connections. One of theURLs, I think it was you that listed, showed it perfectly clear on the go kart. Sorry for the obfuscation..
geometry only stays accurate near the straight ahead direction. Actually, we had talked a while back and you had warned me to swap the MGB arms left-to right, so I made sure that's what I did. I'm glad we had talked--it helped quite a bit. Rotating the end of the arm about 20 degrees kept the end of the arm where was, but allowed a smaller tie rod end to be used, and angled the ball joint so that the tang pointed outboard towards the wheel and the body of the ball joint itself pointed inboard slightly to gain clearance with the rim. Now all I need to do is track down that smaller tie rod end and get some new ones. They do work with the Alpine adjusting rod, so they should work just fine with Dale's steering kit. The final problem is that I have my wheel weights on the inside of the rim and the clearance isn't quite enough between the smaller ball joint body and the edge of the rim when the clamp for the wheel weights is taken into account. It juuuust rubs as the wheel comes around. I think I can shim the steering arm at BOTH bolt points (where it bolts into the caliper as well as where it bolts into the stub axle carrier). This WILL move the steering arm inboard, possibly 1/8". Whether that negates all the previous effort is unknown to me as I don't know yet what the distance the MGB arms move the tie rod end outboard compared to the stock Tiger arms. My stock tiger arms are on my car and Smitty doesn't have a handy set for me to look at. I'll let you know if it works or whether I'm just blowing smoke. As for performance tires, you're quite right. I'm not running performance tires preferring the look of the stock front wheel and tire combination to the enhanced performance. At some unknown time I may make the break and get into performance tires and 15" rims--and then I'll probably be bugging you all with questions about which rims you used, etc., but for now if I can run the 13" rims without compromising the "fix" too much, then that's what I'd prefer to do. > Let me clarify a couple of points. > course, there's the problem of getting performance tires for 13" wheels. > rims, but I think the main reason is to give clearance for larger brakes. > in 16"-18" sizes, with only one or two choices for 15" rims. > tie rod ends relative to the center of the rear axle is all that matters? > the face of it seems incorrect.